They are my perfect food. I’d gladly serve and eat them everyday if I could and never get sick of them. 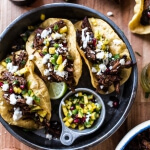 Tacos are just good, easy, fun – and so adaptable. Growing up we really did have tacos every other night. Ok, maybe not every other night, but at least two or three times a week. At least. Of course back then they were only straight up beef tacos with a very generous amount of taco seasoning. No tomatoes, no lettuce no avocados, no salsa, no guacamole and definitely no crema. Just ground beef, flour tortillas for the boys, hard tortillas for Mom and I, a ton of cheddar cheese and salad for Dad, where my mom and I might steal some lettuce from . Sometimes on very rare occasions Mom and I would get our way and get turkey tacos, but to be honest that only happened if we were able to sneak the turkey meat into the pan without the boys finding out. Tacos were just easy and everyone liked them. Well not everyone, my dad would alway makes himself salads every night for dinner. When we were younger we ate boring, boring food. Chicken, tacos, chicken, tacos, steak, chicken and rice with everything. No exaggeration there either. We had rice practically every night and we still have it a lot. No actually my Mom loves rice and everybody else has learned to love it and want it with practically everything, because of her. My dad actually likes good food. Not a whole lot of beef or chicken, but lots of fish, vegetables, tons of spicy food and cheese. But we all love cheese. Cheese is at the top of the food chain around here. So my poor dad ate salad every almost night for like fourteen years. Then I came in and took over the kitchen and he finally started getting food good enough to retire the salads. But he still does love a good salad. Buffalo sauce is his absolute favorite… on anything. Anyway, we still like tacos around here. We just can’t break the taco habit. And yes, we still have them once a week. The boys though? Yeah, they still eat them like every other night, but they are picky and will not eat much of anything else. But I promise the sweetness from the sweet potato is so amazing with the spicy chorizo, like so amazing. 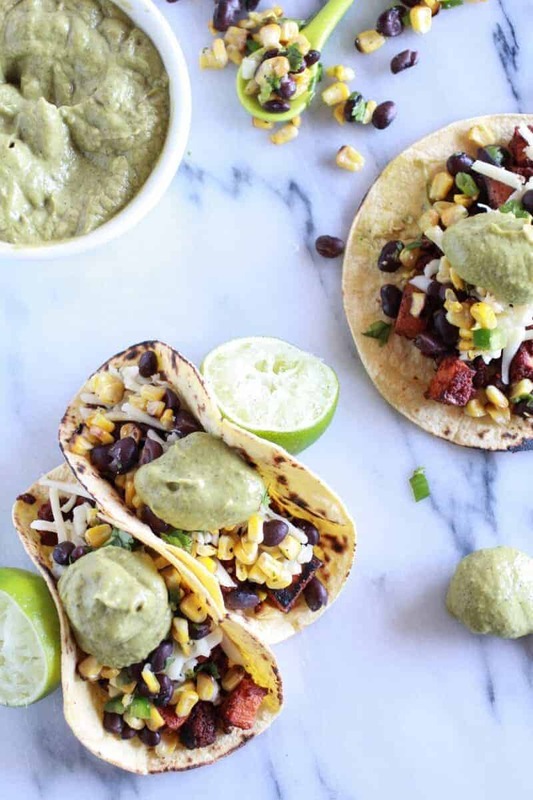 And then with the sweet corn and black bean salsa and the roasted avocado cream? Oh man, if only you knew. It’s so good. And so much better than plain beef tacos. That I know for sure. Plus, there is no oven involved. Yes, NO oven!! I did it, I made a meal that you actually do not need to turn the oven on for. Can I please get a round of applause? Ok fine, just make the tacos tonight. You can all clap then! 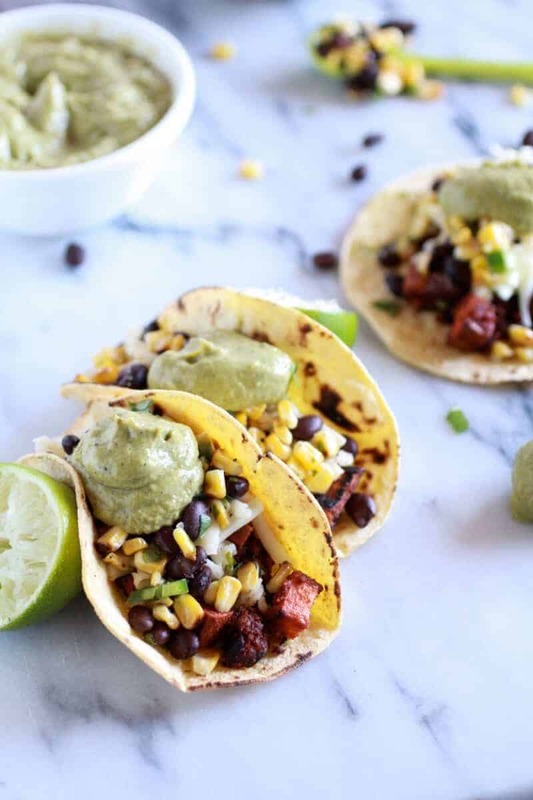 Mix up your taco night with these tasty treats! Heat a large skillet over medium heat and add olive oil. Add garlic and sweet potatoes and stir. Cover and cook for 20 minutes, until sweet potatoes are just softened. Crumble in the chorizo and cook until browned and cooked through, about 8-10 minutes. I like to really grind up the meat with a wooden spoon to make sure the meat gets cooked and browned evenly. While the sweet potatoes are cooking make the roasted poblano crema, remove the core and seeds from peppers and slice in half. Lay on a baking sheet and preheat the broiler on your oven. Place under the broiler skin-side up until skins are completely charred and black – this took about 5 minutes for me, but sometimes is can go faster or shorter. I like to check them every 2 or 3 minutes and rotate if needed. Immediately remove peppers from oven and using kitchen tongs, quickly place in a bowl and cover with plastic wrap (obviously being sure to not let plastic wrap touch peppers). Set aside for 15 minutes. Or you can grill the peppers directly on the grill until charred. Once the peppers are cool remove some of the charred skin (I like to leave some of the skin on, but that is up to you) and place the pepper, avocado, greek yogurt, lime juice and hot sauce in the bowl of a food processor. Add a pinch of salt and pepper and process until smooth. Taste and season to your liking. 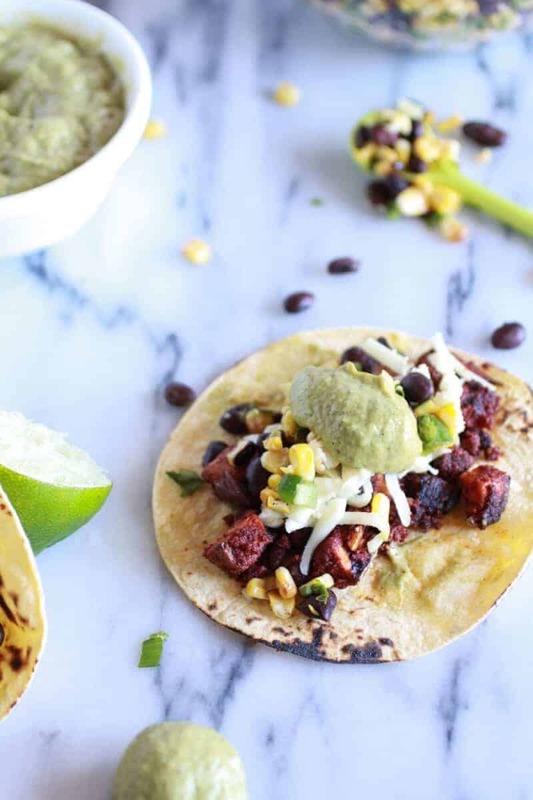 To assemble, place generous spoonfuls of the sweet potato + chorizo mixture in warm tortillas. Top with shredded cheese, then black bean and corn salsa and roasted poblano crema. These are gorgeous! The sweet potato and chorizo is making my mouth water. 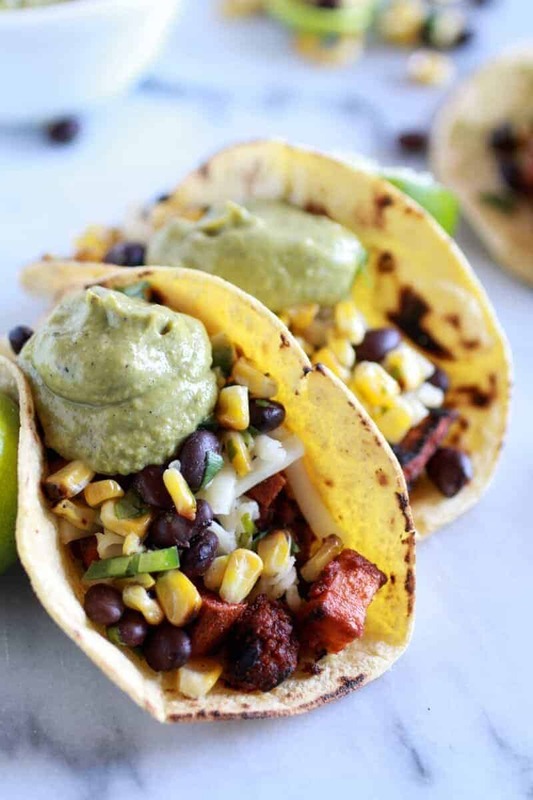 Yup – these definitely look and sound WAY better than plain old beef tacos! 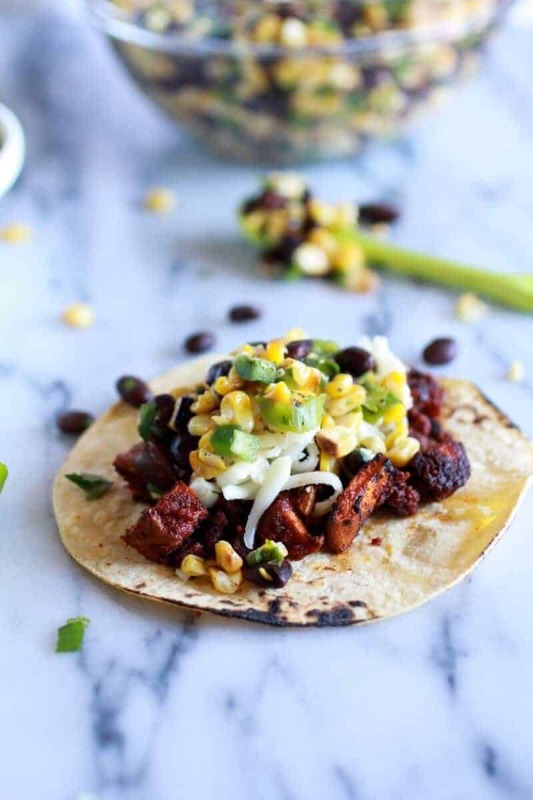 Loving the sound of that black bean corn salsa! Beautiful pictures as always! 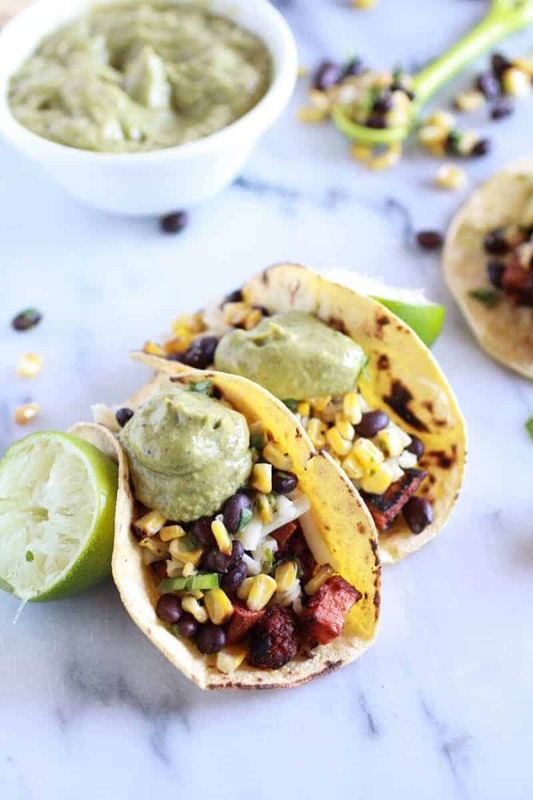 Not only do I love sweet potatoes and chorizo, but I love them together…and LOVE tacos! 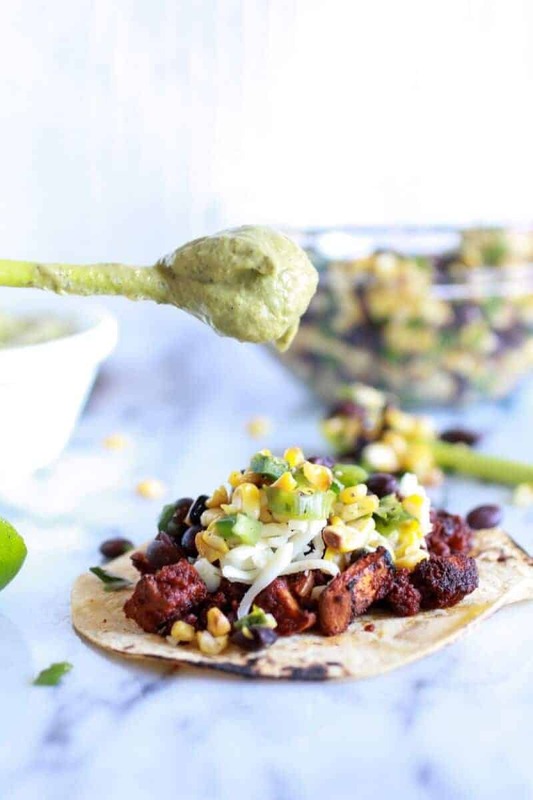 The black bean salsa and avocado crema look amazing – this taco is PACKED with flavor! 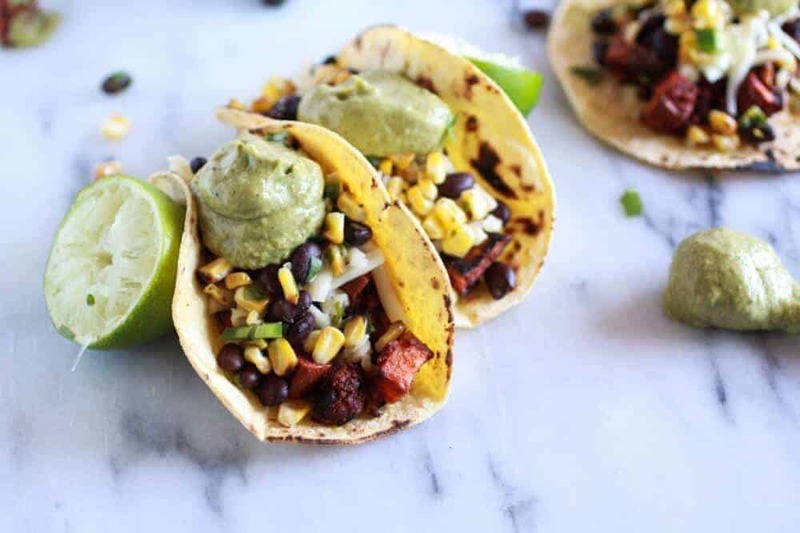 I love tacos – especially beautiful ones like these! Chorizo is so awesome, I bet these are just flavor city! How much Greek Yogurt? Looks great. 1/4 cup and I fixed the recipe. Sorry about that!! You can never go wrong with a good taco or anything Mexican related. Mexican food is my happy place. I can’t get enough of it. 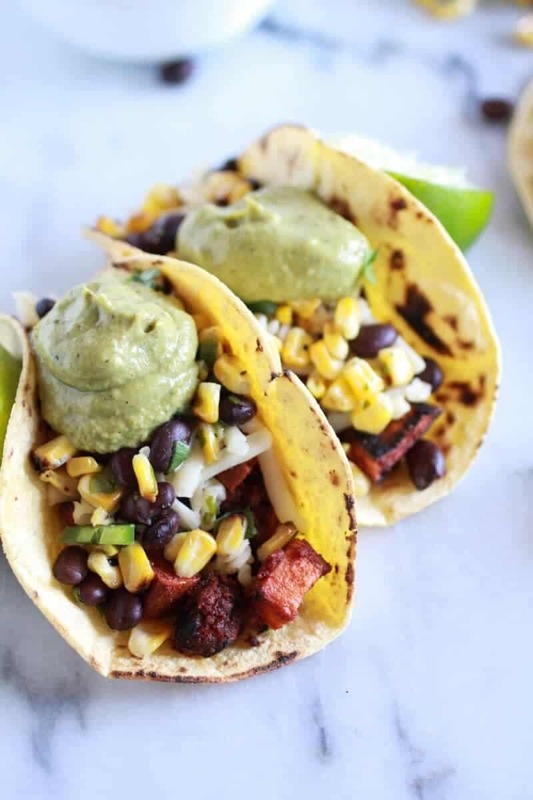 These tacos are so drool-worthy! 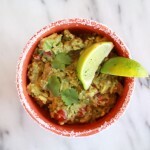 Love the poblano avocado crema!! Must make this. Oh yeah, mexican food is so my happy place! LOL! Not a huge fan of chorizo (I don’t eat pork), so I’ll probably find a turkey replacement. I am sure turkey will be delicious! Thanks Crystal, I hope you love these! Yum. Yum. Yum. You are so creative and I love the flavors you combine! These look delish-i-o-soooo!!! Wow, these look amazing! I love all the bright beautiful colors going on here. It’s so perfectly summer. I love tacos, even though I’m pretty boring; meat, cheese, sour cream. Done. xD But that corn and black bean salsa looks outstanding, and it might just change my life. Also, I have to take a minute to ask you about cameras. Lately I’ve been thinking seriously about investing in a really nice DSLR camera, but I really don’t know where to start. What kind of camera do you use? Because your pictures are swoon worthy. I use a canon EOS 60D with a 50mm macro lens. I love my canon, but it is also the only camera i have ever had, so I do not have anything to compare it to. But I do love it! I think it is worth a little research though to find a camera that is right for you. One that is easy to use and beginner friendly, but then again I learned by trial and error and tons and tons of reading. Ugh, sorry I am such am bad advice giver. LOL! Thanks for your kind words and let me know if you need anymore help!! There is so much happiness going on in these tacos. I love sweet potatoes, fab taco idea! Oh man, I could eat tacos every night for dinner and not be bored. Scratch that — I could eat THESE tacos every night for dinner. So yum! Thank you so much, Tina! !Oh and I already have a dessert tacos recipe. I told you we really like tacos! 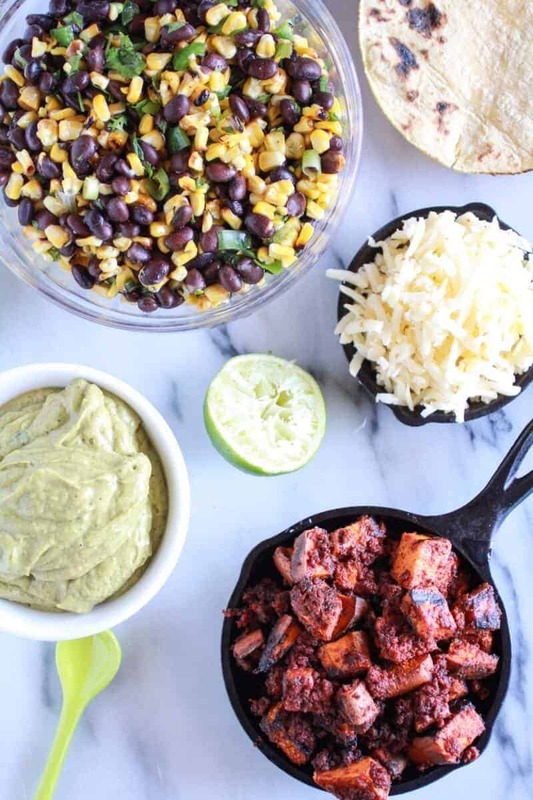 I totally remember those taco nights at home – straight from the Ortego taco kit box! These look phenomenal! And I love the idea of the sweet potato!! Can’t wait to try these – especially the crema! I really need to start using soyrizo in my tacos!! I really love it and I love the extra spice that it gives to Mexican foods :). Whoa! Soyrizo? That is crazy, I have never heard of that! 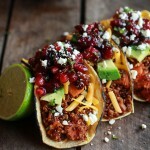 This looks sooo good, i love sweet potato tacos with kale chips, maybe the chorizo will please my husband as well, cant wait to try it, thank you! Thanks Holly! Hope you guys love these! How much yogurt is to be used, you don’t like it as an ingredient in the Poblano Avocado Crema. Oops! Sorry, I used about a 1/4 cup. I just fixed the recipe. Hope you love these! Tacos definitely make every night a happy night! Especially if they involve sweet potatoes. And cheese. Two of my favorite things in life! YUM. Tacos are food perfection. WANT. Oh, perfect timing! I just got a bunch of avocadoes at the farmers market, and the avocado cream…yeah, that looks good enough to simply eat with a spoon! Perfect!! Hope you love this! I love these flavors and love the sweet potatoes. Great idea! These are a million times better than my tacos!! 😉 I love the sweet potato in these!! Just made all of these last night, and everything was incredible! Oh yeah!! So happy you loved these!! Thanks Sarah! Hi Tieghan, just had a quick question on what type of chorizo you use in this recipe. Is it the type that looks kind of like smoked sausage & is vacuum sealed or more like italian sausage style. My supmarket sells both. They also had a spicy Portuguese style chorizo that looked good. Thanks. Hey Theresa! I use the kind that looks like ground sausage!! Hope you love these! Hi Tieghan! My sister and I made these this week and LOVED them! We did have a question though – in the ingredients list, grape tomatoes are included for the salsa, but aren’t mentioned in the directions. Also, cumin is listed in the ingredients for the crema, but in the directions it’s used in the salsa. We ended up not including tomatoes, and put the cumin in the crema but not the salsa. Just wondering what you intended! Thanks, and love the blog!! Hey Brittany! Sorry about the confusion. The tomatoes go in the salsa as does the cumin, but I am sure it was delicious in the crema too!! so happy you guys loved these and thanks for making them! These look great! But why are there only two tortillas called for in the ingredients? Hi Michele, I am sorry for any confusion. I am not sure what you are referring too? So sorry! It’s is 6-8 tortillas. Hope you love these and please let me know if there is anything else. My recipes have been converted into a new recipe layout and there have been glitches with some recipes. Sorry for the trouble! Hi Kristin! 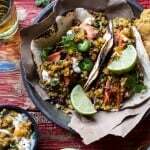 This recipe should make around 6-8 tacos ad will serve around 4-5 people. Let me know if you have questions. Hope you love the tacos! These were a hit! 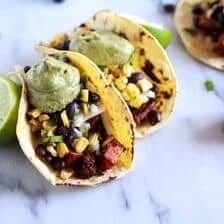 I made these for my fiance who loves chorizo and he said they were the best tacos he had ever had! The recipe is super simple and the result is so delicious. 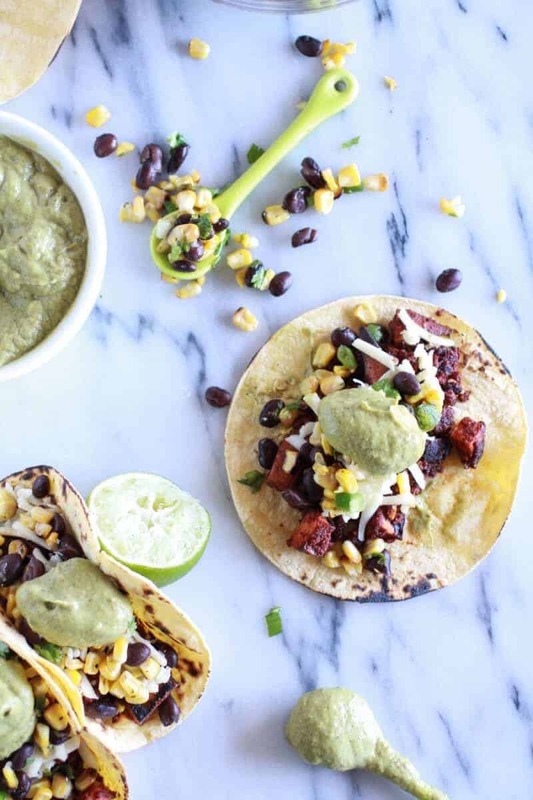 Plus the black bean salsa and avocado cream are full of flavor. I was especially excited about the avocado cream….. so easy and tasty!!! Beautiful meal full of color and flavor! Yum!!! That is so amazing! I am so glad the both of you loved this recipe, Caroline! Thank you! This was DELICIOUS! I used butternut squash instead of sweet potato and didn’t add the corn to the salsa because it’s winter and out of season. I also added a lot more cilantro. On the cream, I used a can of Hatch chilies instead of roasting my own pablanos just because it was faster and I didn’t have pablanos. Otherwise I followed the recipe. Will definitely be making these again. Thank you Helen! I am so glad you enjoyed this recipe! Forgot to mention I also added kale to the taco mixture. Excellent! Used chicken chorizo from sprouts that is pretty clean!